Some background information on the Pentacle. The pentacle is the main symbol used by Wiccans and many other neo-Pagans. The religion of Wicca is based in part on ancient Celtic deities, symbols, days of celebration, etc. They are an Earth-centered religion whose days of celebration follow the phases of the moon and the seasons. The English warrior Sir Gawain, a nephew of King Arthur, adopted the pentacle as his personal symbol and placed it on his shield. It appeared in gold on a red background. The five points symbolized "the five knightly virtues - generosity, courtesy, chastity, chivalry and piety." It has been widely used by past Christians as a protective amulet. It was used to symbolize the star which allegedly led three Zoroastrian astrologers (a.k.a. the three wise men) to the baby Jesus; it was called the Three Kings' star. The five points of the pentagram have been interpreted as representing the five wounds of Christ (2 wrist, 2 ankle and 1 side). This lovely necklace/pendant was created using a 42 inch, olive green silk ribbon....bordered with burgundy thread. The centerpiece is a 2 inch green ceramic pentacle charm. 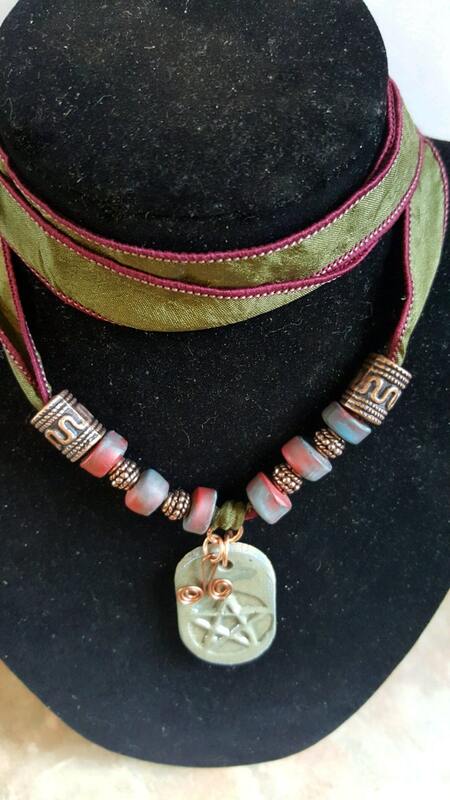 It is adorned with hand-made clay beads and bronze metal beads. It can also be used as a bracelet or anklet. It is adjustable by tying it as long or short as you need. 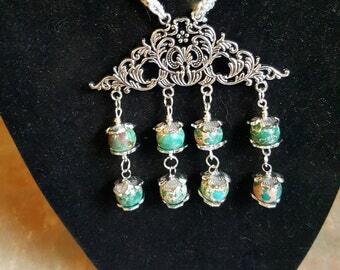 This necklace is a One of a Kind creation.